A Daily Morning coffee with a beach view in a luxury apartment brings you a charming work day by Emmar Beachfront project. A private Island with 360 degree view of Dubai marina on the top of two sky scrappers brings you a stunning and beautiful class of living in Dubai. 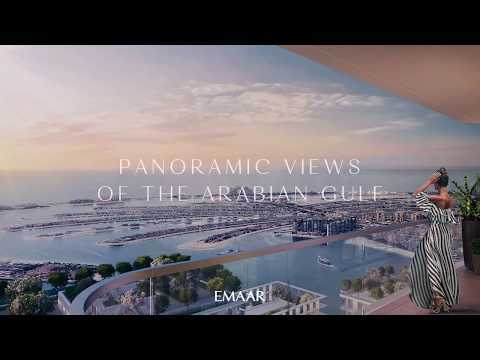 On the line of 27 High rise towers Marina vista offers you 1, 2, 3 and 4 luxury Bedroom Apartments with overlook view of Arabian gulf crystal blue water, Sports view of marina. Now the residence of Marina Vista has an best view to walk in between the beach on either side of the home. Live your dream beach apartment in right out of your door. As each Apartment has a special view to the beach they give a elegant atmosphere for couple living. stay, inspired your life. Choose your own best style of living with one, two, three and four apartments in open horizon in the sound of sea waves. Marina Vista is located in the urban life of Dubai Marina. The First residential apartment when you enter the Island. The access for your residence is much easier than ever by foot, car, or Yacht and easy access to Sheik Zayed road in passing two traffic lights. First Class Amenities Balcony with waterfront view, Covered parking, 24/7 security, Beach access. Access the Pristine Beach in 1.5 KM for Private beach parties. 20 Minutes access to Dubai International Airport.